Advent Calendar - December 5th. 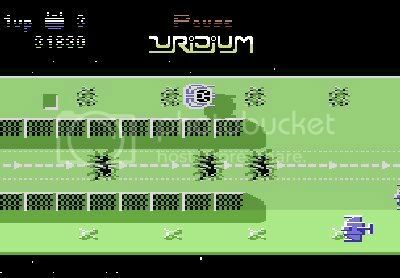 by PaulEMoz in "5th Gear", "Commodore 64", "Hewson", "Spy Hunter", "The Cannonball Run"
5th Gear sets itself up as a game where you're taking part in an illegal, no-holds barred car race. It sounds a bit like The Cannonball Run with weapons which, thinking about it, would be awesome. Unfortunately, it doesn't quite like work out like that. Ooh, a garage! That's handy. Wonder if they've got any Haribo? It's bad enough that there's some tricky terrain to negotiate, but this being the kind of event that it is, there are other vehicles en route that will try their hardest to bring your run to a premature end. Some just drive around in circles in awkward places, getting in the way... others will shoot at you, which is somewhat bothersome. You can fight back, though... your car is equipped with a machine gun right from the off, and there are shops along the route that offer new equipment, repairs and upgrades. This all sounds like a huge amount of fun, but in practice it's not quite as good as you'd imagine. Chief fun-stopping culprit is the small screen size. 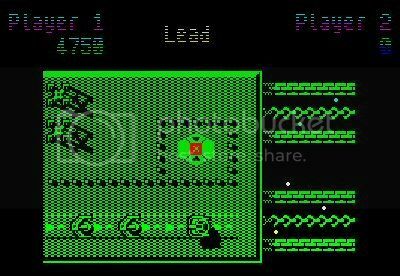 I've measured it (sad, I know), and you only actually get to play on five-eights of the screen... in a vertically scrolling game on a TV screen, that's incredibly restrictive. Secondly, this is billed as a race... but you can't actually go fast. Well, you can, but games won't last very long if you do. There are so many obstacles, such as walls, bushes and bridges that you'll be dead in seconds. And as if that wasn't difficult enough, there are rivers with narrow bridges to cross, although if there's a jump or you have the right equipment you can sometimes take these out of the equation. 5th Gear has all the makings of an excellent game, but it's hamstrung by the game design and the difficulty. 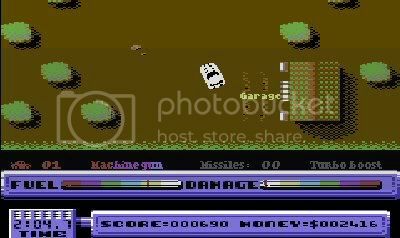 It's a shame, because a combat racer could have been a huge hit on he Commodore 64, and in fact I reckon this is one of those games that could still make an excellent game if it was remade on one of today's consoles or PC. Anyone out there fancy giving it a go? 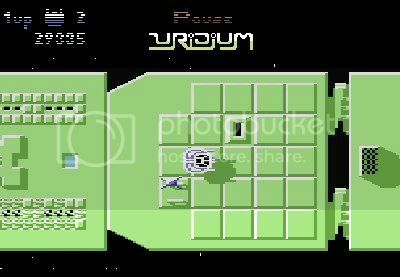 by PaulEMoz in "Andrew Braybrook", "Commodore 64", "Dominic Robinson", "Graftgold", "Hewson", "Uridium", "ZX Spectrum"
After yesterday's less than successful effort, I felt like I wanted to play Uridium properly. And then I realised it was the ideal candidate for the next episode of FIGHT! This is particularly true when you compare them on the main platform-specific websites... on Lemon64, the Commodore 64 version (which is the original) only averages a user rating of 7.79, and doesn't manage to crack the top 100, whereas on World of Spectrum, their version does hit the top 100 and averages a user rating of 8.49. Intriguing. So who's right? 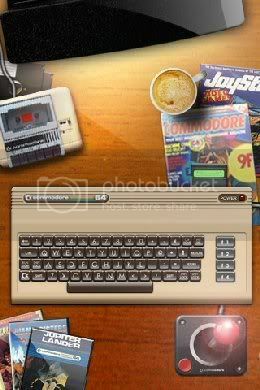 I'm very familiar with the Commodore 64 version. 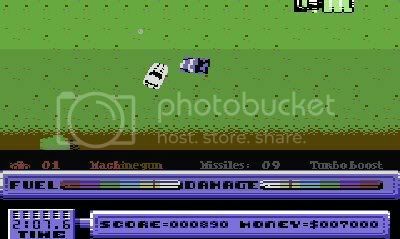 Programmed by Andrew Braybrook, one of the 64's premier coders, at the height of his powers, it's a slick arcade shoot 'em up that requires quick reflexes and a fast trigger finger. It's incredibly polished and a lot of fun, and I spent hours and hours with it in my younger days. Five-to-one problem... need fast trigger finger to deal with! 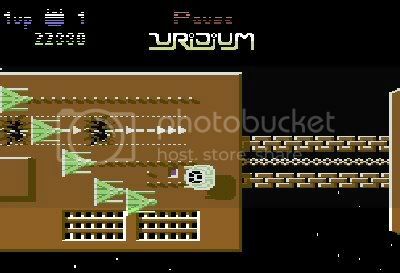 For the uninitiated, Uridium is a two-way horizontally scrolling arcade shooter, which sees you piloting a spacecraft against fifteen massive enemy Dreadnaughts. Each of these must be destroyed, but it's not as simple as just flying up there and blowing them out of space... they'll send waves of fighter ships at you. They also have proximity mines on board, which are released if you fly over or even near their ports. And finally, just getting from beginning to end can be very difficult... the Dreadnaughts are littered with structures, which prove deadly if crashed into. And you do have to get from beginning to end... you have to land on the runway before you can destroy the Dreadnaught. Slipping back into the pilot's seat of the C64's Manta felt very comfortable. It's a pretty fly ride, nice and responsive, able to accelerate quickly although braking is sluggish, capable of flipping in a 180 degree manoeuvre, and also of flipping onto its side, which is handy as there are some tight gaps to squeeze through. It also pumps out a more-than-passable amount of bullets, and even though enemy attack waves number no more than five or six, they're accurate, so you need those bullets to take out as many as possible as quickly as possible. Mine! Mine! Hey, if you want it that much, you can have it! The 64 version is a glorious arcade blast. Always was, and probably always will be. It's not perfect... the gameplay is by its very nature repetitive, but the different dreadnaught layouts help to make up for that, as you're always on edge, wondering where the next tiny gap or obtrusive structure will be. It's a bit of a pain having to wait around by the runway for the Land Now signal (if you get there too early... there's a very real danger that you'll be blown to bits before then. 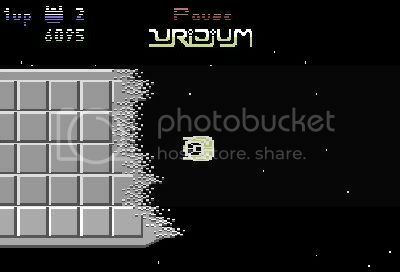 There's a sequel, though... Uridium+. And that game rectifies the Land Now issue, moving it one step closer to perfection. The red square is a mine port... they're really fast, so I'd get out of there! What of the Spectrum version, then? 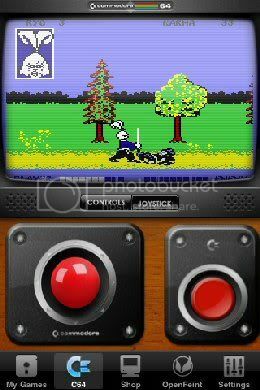 Is it better than the Commodore game? Is it even as good? My honest opinion is... no, it's not as good. It is a fine game, though, and a great acheivement for the Spectrum. The Dreadnaught layouts are different, which I appreciated as it effectively makes it another game to learn. 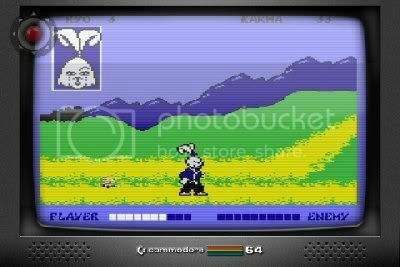 Attack patterns are similar though, although the game is even more unforgiving and difficult. The Manta controls well, but the game is let down slightly by the scrolling, which although not exactly jerky, tended to give me a headache after any reasonable length of time. Those enemy ships on the runway are sitting docks... blast them while you can! There are a couple of things missing from the Speccy version, too... neither of which is gamebreaking, but worth a mention. 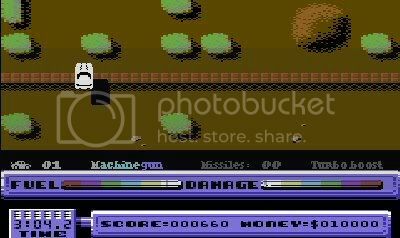 When you end a level, you play a brief bonus game on the Commodore 64 to determine your bonus. That's gone on the Spectrum. 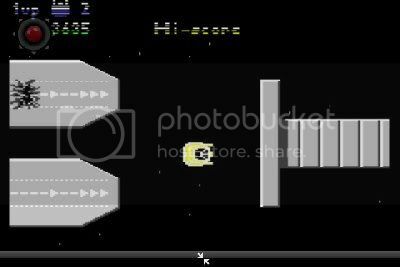 Also gone is the cool fly-by at the end of the level, where the dreadnaught boils away and you get the chance to blast some of the ground features youDmay have missed before you landed. Like I said, not gamebreakers, but just little touches that add to the overall experience. One down, fourteen to go. Spectrum owners are unlikely to have seen this bit.